Extreme levels of conflict and violence in the besieged city of Mosul - including airstrikes, bombardment, suicide attacks and gunshots - are taking a devastating toll on the people who call it home. 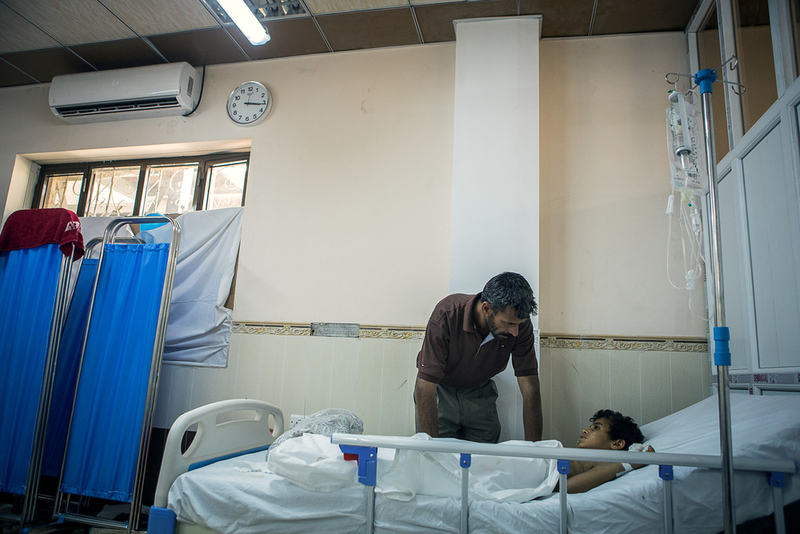 In less than two weeks since officially opening our hospital in west Mosul, Médecins Sans Frontières (MSF) has treated over 100 patients for war-related injuries - including more than 25 children and 20 women. It is one of only two functional hospitals in this part of the Iraqi city. However, we fear that only a small fraction of residents are able to access medical assistance on time, and that many are dying on the battlefield. *The video below depicts our hospital in east Mosul, not west Mosul - but it servers to highlight how we operate in Iraq in this time of conflict. Below, we share the story of one Iraqi family - torn apart by violence and conflict beyond their control. Covered in dust, four-year-old Ahmed* sits on his father's lap outside the MSF hospital in west Mosul. The boy devours a biscuit that’s just been handed to him, covering his face in chocolate. 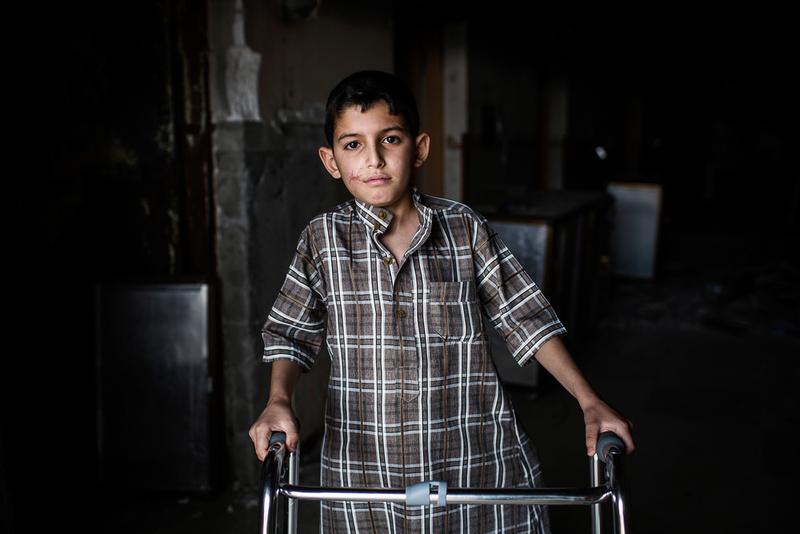 For the moment, Ahmed seems distracted from the horrors he's survived - including the death of his two brothers. Samir, the boy's father, comforts the child's grandmother sitting beside them, helping her drink water through parched lips. Her face is a visceral portrait of the family's hardship. Just a few hours ago, the family escaped through a deadly gauntlet of conflict and violence in Mosul's Old City, running through the few blocks which are still under siege. Their home was right on the edge of the battle between Iraqi forces and the Islamic State group (IS) - marked by intense bombardment, airstrikes, suicide attacks, improvised landmines and sniper fire. This morning, the house was re-taken by advancing forces. But the relief came too late. MSF medical staff in west Mosul attend to a boy arriving from the front lines in the Old City, bleeding heavily from the ear due to an explosion injury. 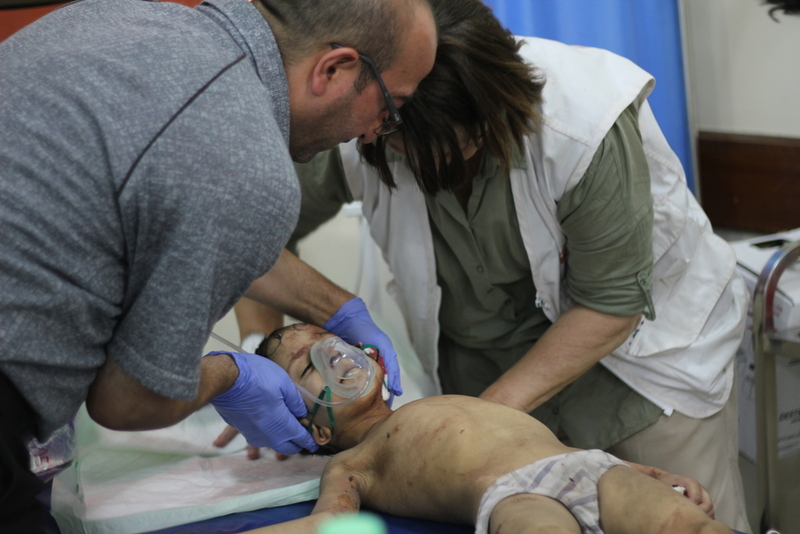 “[Three days ago,] my wife was holding our son when a mortar fell,” says Samir. “The wall collapsed in the room next door where my wife and sister were. "At first I couldn't enter the room; there was so much dust I could not breathe. When the dust settled, I went in and began digging through the bricks. I heard my wife screaming and I uncovered them. I picked them up and carried them out. "When I removed all the bricks I discovered my son was dead. The air filled with the sound of sobbing, wailing, cries of pain and shock, and guttural exclamations of relief after finally escaping. As Samir speaks, his grief-stricken mother alternates between mournful exclamations and filling in the background of the story through her tears. “My granddaughter died of starvation and I also had to put my grandson in the grave," she cries. "Two of them; one starved to death and the other was hit by a mortar. "I buried them in the garden." Now, Samir's wife lies on a hospital bed in a neck brace, and his sister is across the ward. It is morning and as medical staff prepare for more patients, the sound of explosions can be heard from the front lines. Yesterday was the busiest day since the hospital opened, less than 10 days ago. Ambulance after ambulance, patients arrived. Wounded patients, mostly women and children, seemingly poured into the hospital, brought in from the front lines: a little boy with burns covering his arms and legs; a woman appearing to be in shock, her face obscured by blood; a little girl in a flower patterned dress, right leg lacerated by shrapnel and left leg blown off at the knee. The emergency room turned into a brutal testament to the horrors this battle has inflicted on residents. A boy is received with extensive burns to his arms and legs after arriving from the front lines in the battle for Mosul`s Old City. A little girl told a staff member how she watched her brother die right in front of her. The air filled with the sound of sobbing, wailing, cries of pain and shock, and guttural exclamations of relief after finally escaping. Family members accompanying the injured wore stories of hardship on their faces: malnourished cheeks, blank stares, weeping eyes and bodies covered in blood and dirt. One woman sobbing in the waiting room paused only to drain a juice box, before the tears resumed. The little boy with deep burns on his limbs still managed to gobble down biscuits, even as his face contorted in pain when dirty burns were cleaned by hand. “Hunger and suffering,” an elderly woman says from her emergency room bed, repeating the words over and over. She is 74-years-old and had just escaped the battle zone mere hours earlier. “We tried to convince the children to eat tomato paste. "We would boil flour in water… the rice we had was so dirty even animals could not eat it,” she says. 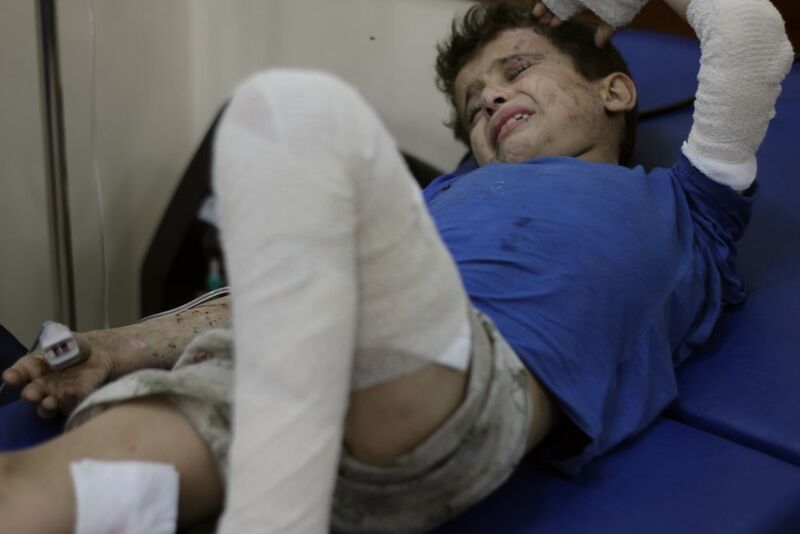 “Every day we were dying because of the shelling and airstrikes. We don’t know where it was coming from. A woman receives surgery to remove a piece of shrapnel from her heel in an injury she sustained weeks earlier. She fled Mosul with her injury. Our facility in west Mosul is one of only two functioning hospitals in this area, and the first priority is life-saving assistance. Medics work urgently to clear beds for new arrivals by referring patients to other hospitals for follow-up treatment as soon as they are stabilised. Despite the influx of war-wounded patients, only a small fraction of the thousands of residents still thought to be trapped in the fighting are making it here. Our greatest fear is that the most urgent cases are dying in the battlefield due to the intensity of the fighting, unable to access life-saving medical assistance. "Some scars will not disappear"
Happily, for Samir's family, his wife and sister are among those made it out on time. They will be referred to another hospital and their journey of healing will continue. But some scars will not disappear. Samir and his wife had three children, and now only one is still alive. With nothing but the clothes on their backs and no money in their pockets, the family steps into the ambulance after their loved ones are loaded in on a stretcher. Shortly after, the vehicle pulls out of the compound. It won't be long before the ambulance is back again, with another patient fresh from the battleground. Many others - still trapped in the unfathomable tragedies of the besieged Old City - may never even make it into the ambulance.